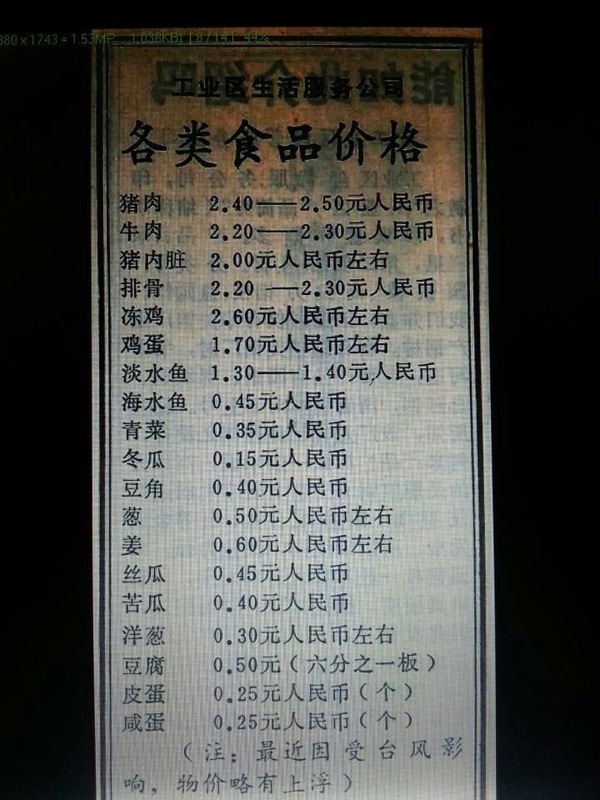 A price list from the Shekou Industrial Zone Life Services Bureau, early 1980s. Of note? Uniform prices throughout the industrial zone, although some prices were “approximate (左右)”. The reason? typhoons determined availability of food and goods. Also, prices are modified with the characters for renminbi (人民币) because at the time, Hong Kong dollars and Foreign Exchange Certificate (or waihui 外汇), a surrogate currency used by foreigners also circulated. Long ago and far away, one industrial zone, three currencies. Not only the typeset makes this list seem like it came from another place and time. The prices seem so cheap its hard to remember that these prices were expensive relative to neidi, where monthly salaries still ranged between 20 to 50 rmb. During the early 1980s, coming to the SEZ and/or Shekou Industrial Zone was considered hard, but nevertheless resulted in opportunities to earn more elsewhere. In fact, by the 1990s, Shenzhen and Shekou boasted a substantial wage (both white and blue-collar ) differential with the rest of the country. And today Shenzhen along with Beijing and Shanghai continues to have the highest lowest minimum wage in the country (see China Labour bulletin report). Shenzhen’s economic success remains one of the key symbols of the success of post Mao reforms. It is no surprise, therefore that both Guangdong and Shenzhen have been central to Xi Jinping’s ongoing efforts to middle class-ify China. But. The extent to which rural China — both in the form of migrant workers and urban villages — has enabled Shenzhen’s success remains left out of these rags-to-riches scenarios. This entry was posted in noted and tagged economic success, history, musing, rural china, shekou, shenzhen identity. Bookmark the permalink. ← taihua and the emergence of a shen-zen. seriously. Hi, I want to write about this for a website called The Nanfang. Do you have any idea what quantities the list might be referring to? For example, 2.2-2.3 yuan for a fillet of beef is 20% of what it is now, which is interesting but not that shocking. It’s 0.3 yuan for an onion or a certain amount of onions by weight? A jin, which is roughly 1/2 a kilo.